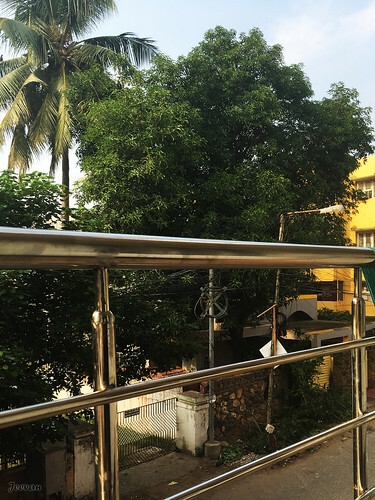 It was raining from last evening in Chennai and the city was almost cool down, and looks alike everything goes favourable for the northeast monsoon to pick up tomorrow. At our previous house rain was the real threat for us, and it was almost a force forced us to move out and it was there while everyone enjoys showering our thoughts were that rain shouldn’t last longer. Now, looking out the balcony I feel how pleasant was the rain, though it isn’t a new feeling, it sense something missed out longer. 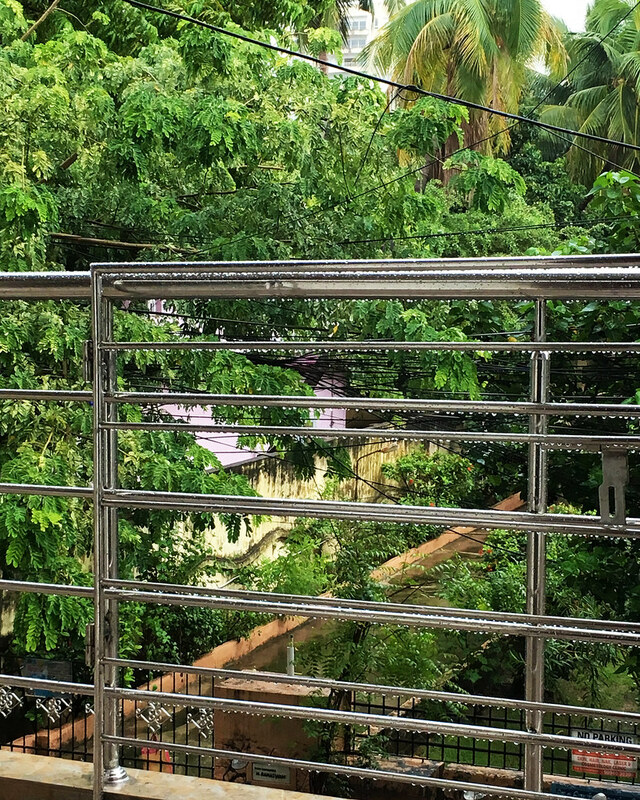 The array of rain drops looks impressive, studded along the steel rails of balcony contrast to rich green backdrop with trees and palms of neighbours. As you all know the reason why we shifted house (threaten to flood entering home in monsoon as it was positioned down) and get back to our own house, we never need to face it again but still a heavy rain could be a problem to anyone and other. 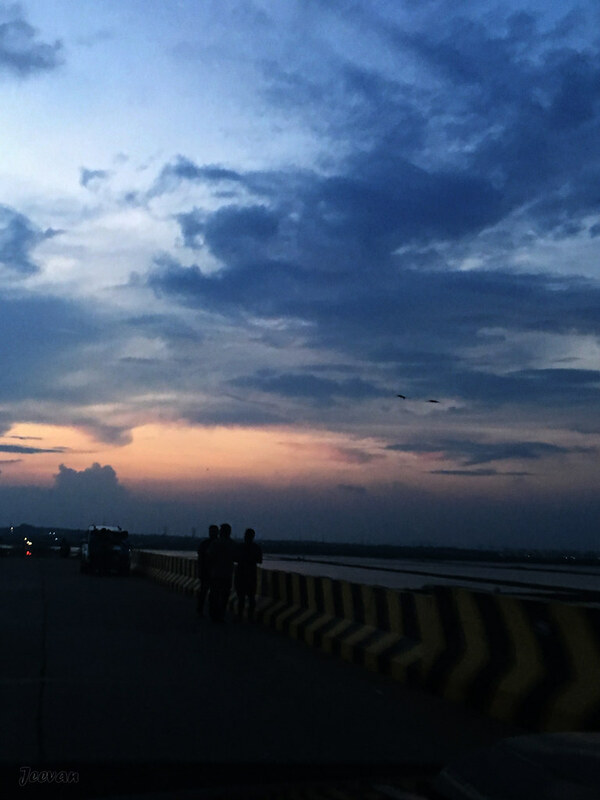 The weather condition was really helpful and brings hope of rain, what Chennai-ties and others need, but with the most celebrated festival (Deepavali or Diwali) on Nov 6, the rain could be a challenge for people out at purchase and those looking forward to celebrate festival. 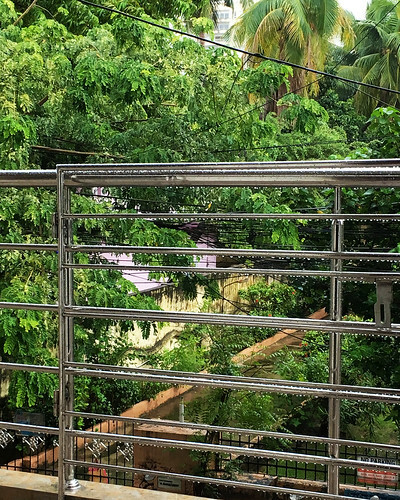 Rain is enjoyable, and with an open sky out here along with pretty flourished trees it brings a sense of atmosphere where it is a pleasure to watch rain from a safe range. Goats are regular visitors into our area from the neighbourhood, where they are reared by some and these goats are often found on roads searching for foods at garbage bins and shrubs that are available at neighbours’ houses. During our stay at the backstreet here they rarely come in search of food but after shifted to the main street I see them often, mainly in front (opposite) to our house, where they enjoy munching on the leaves and fruits of the Portia tree, which aka Indian tulip tree or Poovarasu in Tamil. I can do a post on it later. 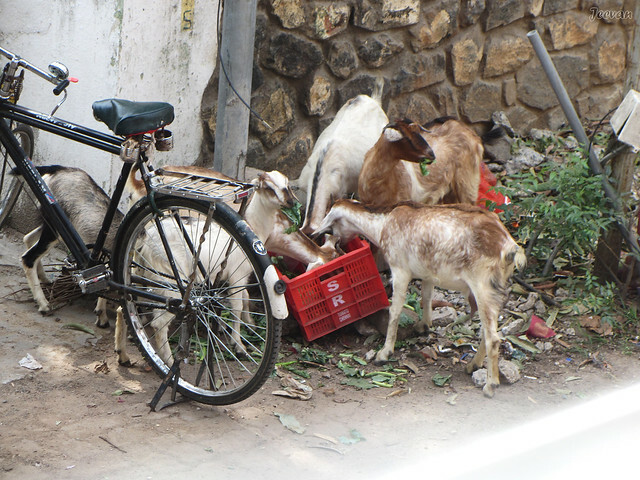 Sometime the goats even climb on the parked bikes when the leaves are beyond their reach. 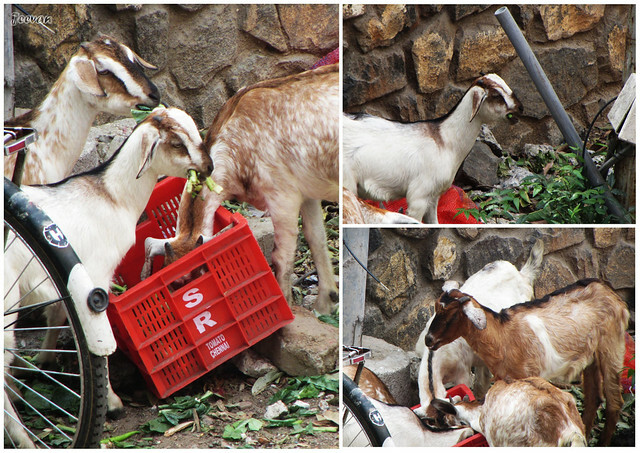 Today I saw a group of goats, mostly young ones, munching on the leftover vegetables, from a basket placed by the veg shop owner next to our house and I just captured it (from the balcony) to share with SaturdayCritters. On Tuesday morning, as I saw the mango tree in the house opposite to ours was pruning, I instantly took a snap on the tree before it lose some green limbs. Seems the tree has overgrown or got dense to block their ventilation or lighting, and I see it as a regular activity on the tree to sustain its shape and size with northeast monsoon expected to begin next week, the rain would help the tree thrive much better to reproduce mangoes in summer. Our street has many trees either grown on roadside or inside the residential houses, alike the one in image gives wonderful look and shadows on the street. My cousin has planted couple of trees along the compound of houses opposite of our house and it has thrived greatly which I could share at another post. Picture here was shot through my balcony fence or rail. Yedappalli is a beautiful town village, located between Coonoor and Kotagiri in the Nilgiris, and what I really like there was the different types of houses and architectures which gave me lot opportunity to take photos, but unfortunately I couldn’t use my camera and shot only with mobile. 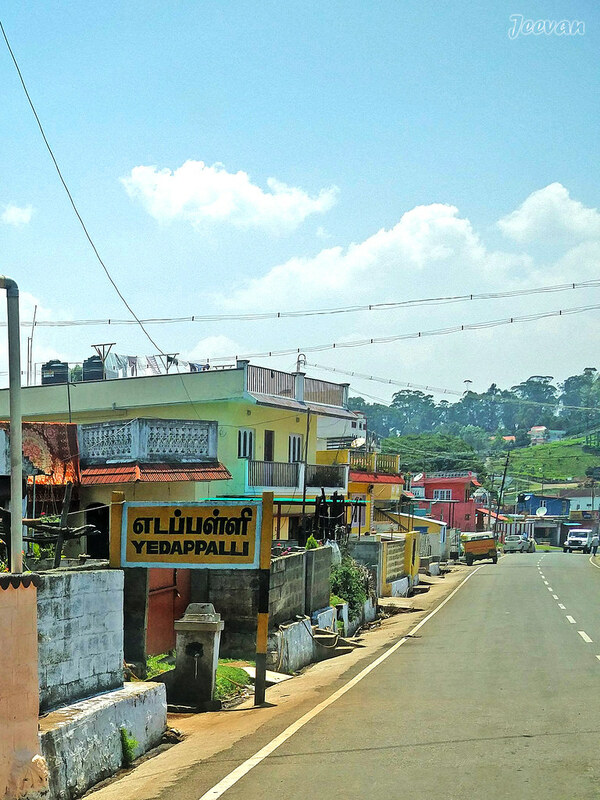 We stop at this village for a cup of tea, couple of time, during our travel through Nilgiris; and I simply loved this place and the colors used on the houses with very simple and neatly build for their capability. I believe you get to see more colors than RGB, in the picture above. I really need to say I had a good tea there and just for that we made another stop at the village during our return journey, in April 2017. Been 25 days since we shifted to our house, things and life is slowly settling down to breathe enough but still the sofa set is unvarnished and some touch up work pending on main door, we’re back on track. I got some books to read and some waiting to be finished, and as I caught with cold on other hand keep me away from here and I’m really having some good, relaxing time by reading and listening to music to keeps me away from other distractions I’m going through these days. I got to sky watch more often these days, from the balcony and through door and window it feels pleasant to go through the changes every day, time and motion and you can expect more sky shots from now where I watch sky from wake up to sleep. House entrance through balcony, shot when the door was removed for varnish. We get more than enough sunlight throughout the day for the hall and our bedroom, which extends even up to kitchen at far end. 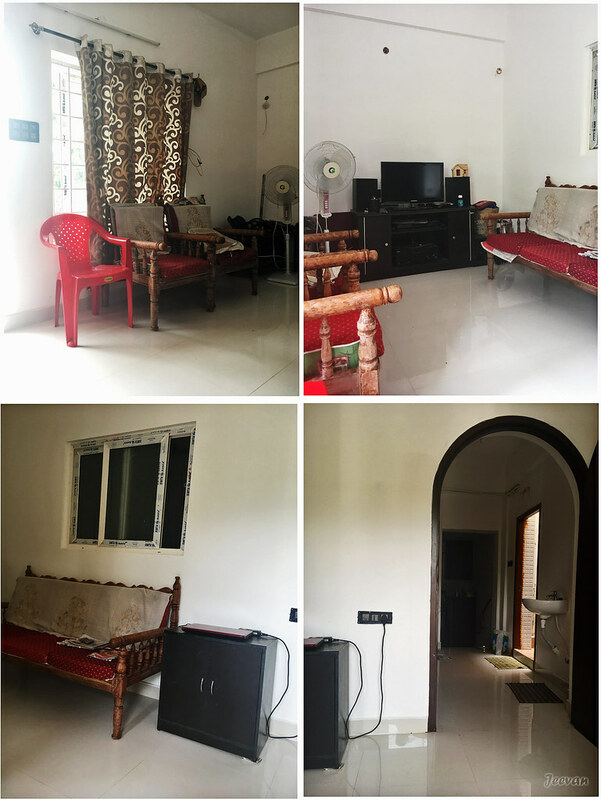 Our house is built on 800 sqft and the partial building was 35 years old, and the front part is 20 years and 2 feet higher than the former part, so a kitchen and bedroom went at the lower part and the hall and our bedroom and veranda is few steps above. Due to lack of financial support, then, only partial building was rebuilt and attached with the older part that was low at floor. 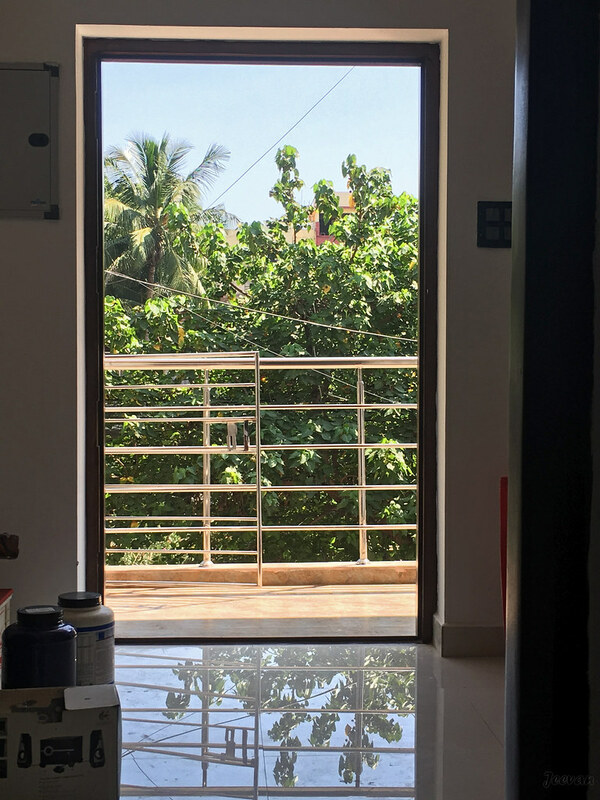 As you know it’s a first floor portion and we moved out mainly to the difficulty of climbing up and down, carrying me all the way, but we have moved back as we could afford a hydraulic lift to elevate me, we decided to adjust with few steps climbing down to kitchen and bro’s bedroom. And I will leave you with couple of collages made on the interior of the house, which I hope you all would like. I could share some more in upcoming days. The four frames on our living room and the wooden sofa set (in distracting way) is longing for varnish which has been put hold and incomplete by the workers. We had bi fold doors for our bedroom to easy access through wheelchair and the door ways are widen more than 3 feet for the same. We have open space opposite to our bedroom for more light and air. Last Sunday I went out for a drive on ECR (east coast road) after long time and I could see many changes en-route, which I took last while travelled to Kodai in March. 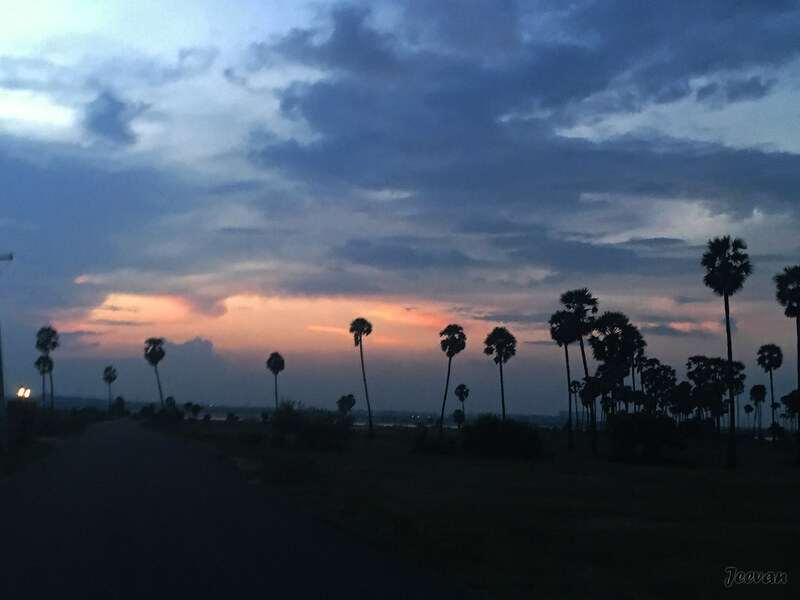 We made a drive till Mamallapuram and amazingly the entire road was empty and was unlike a regular Sunday, where people throng at various amusement and tourist spots along the scenic highway. Perhaps, this unusualness is because of the early Red Alert by the Indian Metrological dept. warning that Sunday would witness heavy rainfall across the state should have put off planning a weekend trip by many. 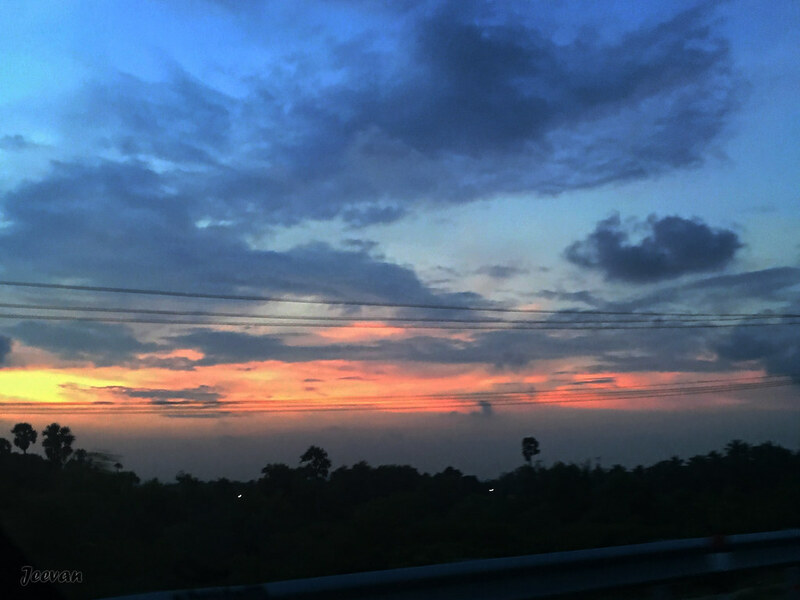 But the warning was withdrawn on Saturday and the Sunday was quite a pleasant day, and as we drove out by evening it wasn’t hot and the sky was far blue with clouds making lovely presence. About 6pm the sun hides away, leaving back some pretty and colourful twilight skies what you could see in the photos and as we come across the Great Salt Lake area, the sky opens up for great views and the palms scored well at foreground. Post mom’s surgery I haven’t gone anywhere and while she healed well, began the renovation work at home keeps me away from traveling or even head out for the nearest beach. Our car went for service at my uncle’s workshop; taking more than 2 months for a complete checkout, was also a reason prevents me going out. I also haven’t used my camera much these days, since I started to use iPhone taking photos using camera has come down, though I love capturing through camera and enjoy focusing which I don’t content with phone camera. 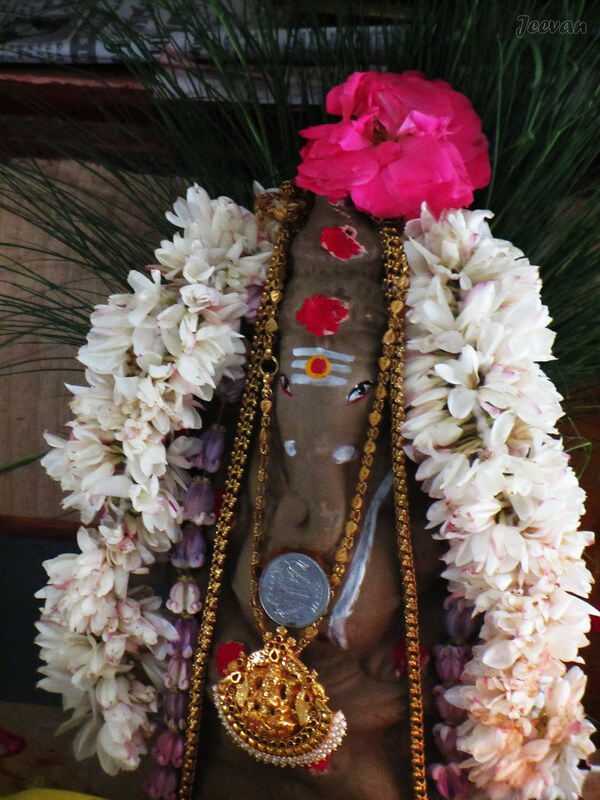 After my travel in March to Kodaikanal, I seldom took out the camera for shoot and only last month I tried to capture some nice photos on the idol of Ganesh that bought for Ganesh Chaturthi. 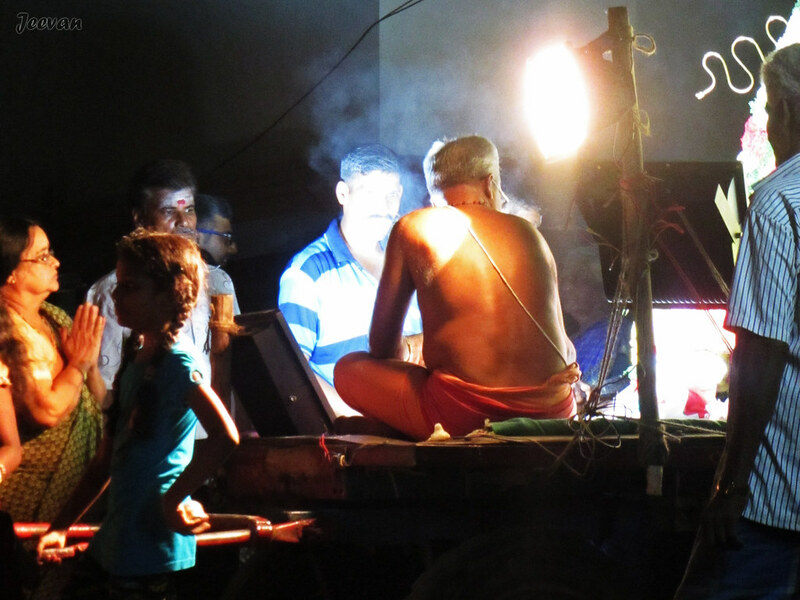 At night I focused on the Ganesh procession that came on our street, from the temple on same. But there too iPhone took prior! 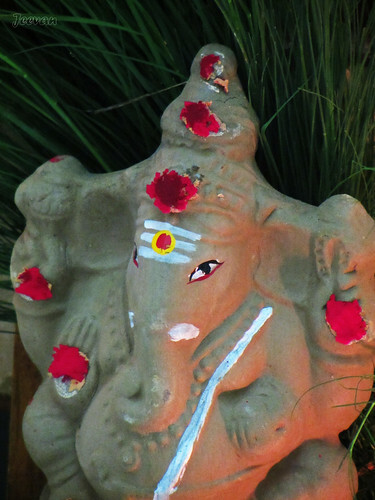 Following are photos shot on Ganesh Chaturthi. Here come the clay idol of Ganesh that dad bought for the Ganesh Chaturthi, from the temporary shops that come up along the main road during the festival times. Though being an atheist, I do like anything that comes up beautiful and decorative and moreover I don’t want to keep away or deny what’s happening around me although my belief is different. For last few years the idols bought doesn’t had a real shape of Ganesh or features to be consider except the two eyes in red black seeds. 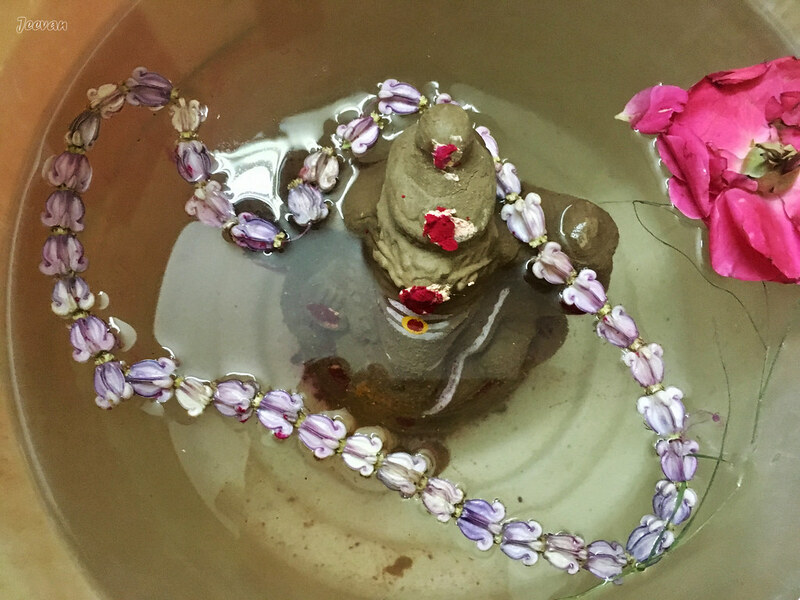 But this year the seeds are missing and the Ganesh had his face painted in watercolors to look pretty good and shape was also fine. Later he was decorated by mom using flowers and jewels. Following same evening the clay idol was dissolved in a bucket of water, a custom we have been practicing for last 10 years back, instead dropping at river or sea what we had done earlier and many still follows. I really don’t like idols immersed at beaches or any water body to pollute it environment. I love beaches and never want to see its beauty being spoiled and the number of idols, either made of clay or plaster of parries or whatever materiel damaging the beach or river front. I have seen many clay idols of Ganesh are thrown along the beach sand rather drop at sea, take lot of time and work to clear all. 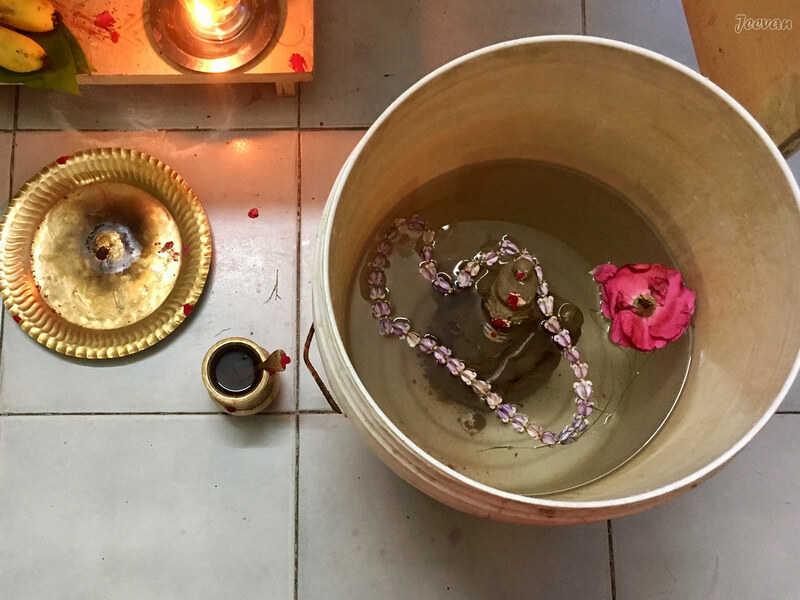 Keep this in mind, I suggest my parents to follow this way (of dissolving the idol in a bucket of water) and use the water for gardening, perhaps this won’t interrupt their faith. The same night, a cart procession takes place at our street from the Ganesh temple, at the street end, and the decorated idol was pulled around the streets where people come out of their house and offer prayers. When the procession comes across our home I tried to capture some photos between the interruption of people and the result was above. 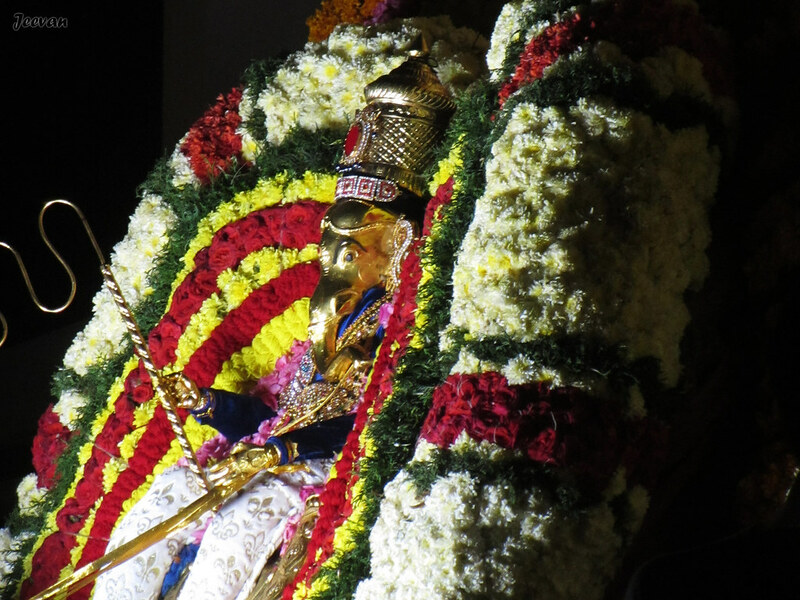 There are two Ganesh temples in our area, but this time only one has come up with procession and they really done a nice decoration where the Ganesh was seated on a mice idol (his divine vehicle) with gold coated rope and whip in hands. 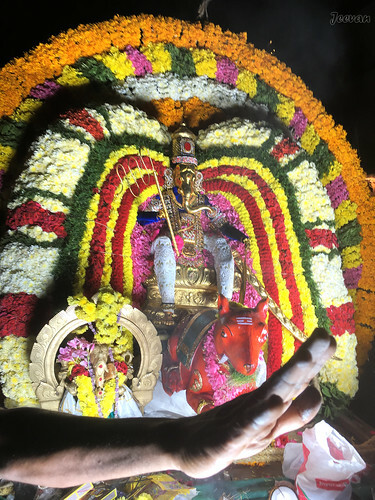 The picture below was shot by mom from the front of the procession where Ganesh seen seated on mice chariot, and in another shot was the priest sitting on the cart doing pooja. As we planned to move to our newly renovated home in the 2nd week of September, I agreed for the transfer of our broadband internet, which took place in few hours of contact with the Airtel network on Sep 12, but the work delay at the home took more than 10 days and we really moved on Sep 24 with still bits of carpentry work. The move wasn’t quite happy and we were in frustrated mood because of the work delay, dragging workers and loss of money and I can’t still believe a renovation (that too doesn’t have enough work) would take such long time of 3 months. Things continue for arrangement with little works taking place on each room, we kept clearing and rearranging things for our comfort, for the whole week. Few of our wood furniture were still lying on the terrace for varnish; the guys who left incomplete haven’t turned for last few days. 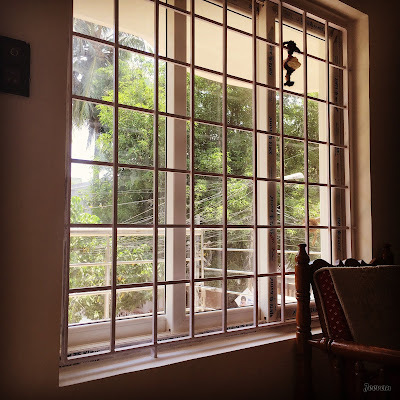 We spent more than a week at our previous house without air condition (since we shifted it earlier with the available of serviceman) had been nightmares and was able to sleep only past mid-night when weather turns better. A week had passed since we shifted to our renovated home and I get good enough sleep here and there isn’t any difficulties to complain about other than the interruption of carpentry work, I went for an evening walk yesterday using the hydraulic lift to climb down (from the first floor home) for first time after lifted up. The thing I find bit annoy was the little noisy environment here. Since we moved out 13 year ago, the houses we lived these years’ adjoined peaceful environments and our previous house in backstreet was also surrounded by silence. Our house is located on the main street that was connected by four other streets make almost vehicle passing through it, keeps away the silent mode. But except mid-morning and evening, I could feel peace and quiet at moments. 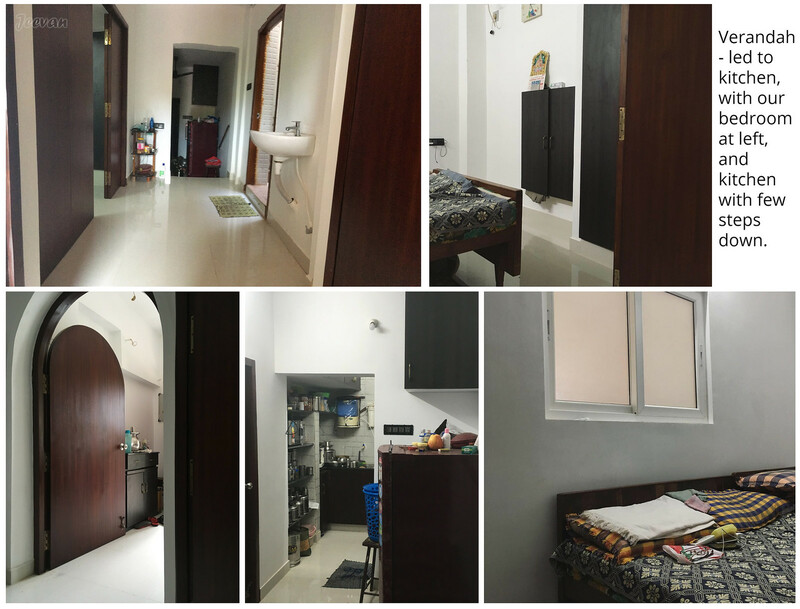 Though a week passed, I couldn’t take any neat photos on the home or to say anything placed exactly to show up. Hope everything settles at places by the weekend and only the outer wall painting was in pending. 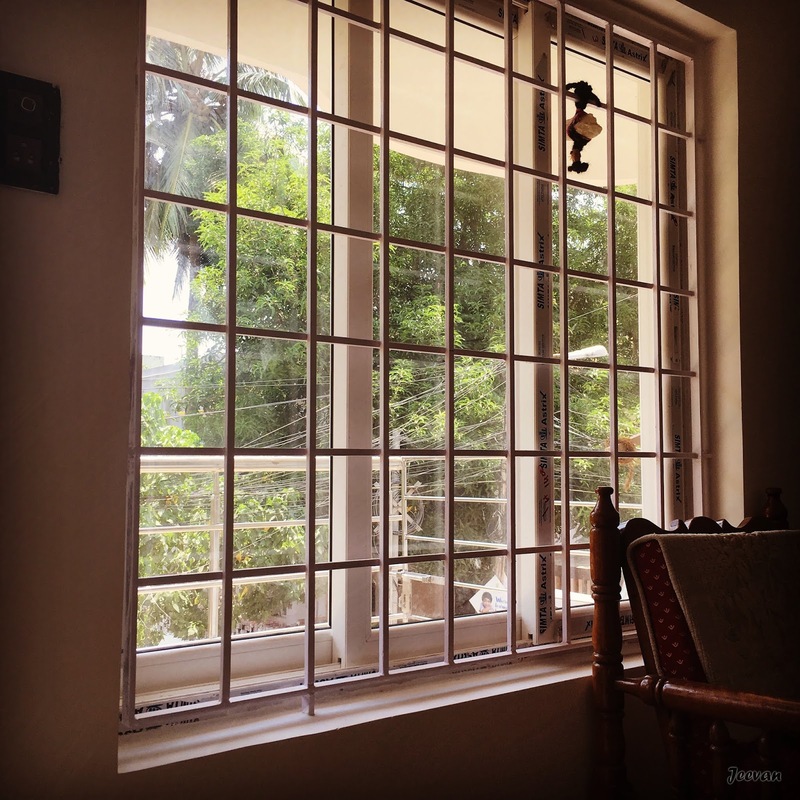 And I could continue blog from now and I leave with the picture of my pretty window view.